It will be at least one month before the Department of Transportation makes any decision on the first traffic camera reports. New rules required cities with speed or red-light cameras along state roadways to submit a report by May 1st to show how the cameras are being used to improve traffic safety. The director of the DOT’s office of traffic and safety, Steve Gent, told the Transportation Commission 10 cities or counties have the cameras and six — Davenport, Muscatine, Cedar Rapids, Des Moines, Council Bluffs and Sioux City — filed reports. 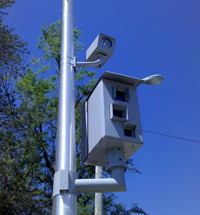 Clive did not file a report as the city has decided to shut down its cameras in June. Windsor Heights and Fort Dodge also did not file reports. Gent says those two cities have decided to only place their speed cameras on local roadways, which are not covered by DOT rules. Polk County also did not submit a report and Gent says he has been unable to find out why county officials have not responded. Gent says they will work collaboratively with cities throughout the review, and then they will sit down with the DOT director and make a decision on any action.